UPDATE September 9, 2018 – We just returned from a first time “without snow on it” walk on this trail. The base is very fine sand which is rather wearing on the legs and back. I rarely recommend a trail just after a rain, but this one would be improved by being wet for sand compaction. This trail isn’t listed on any I’Net site as it’s actually part of two much larger trail systems. I’ll explain. There are two hiking associations in Northumberland County. They are the Ganaraska Hiking Trail Association (GHT), and the Oak Ridges Trail Association (ORTA). A lot of these two associations’ trails run along roadways. However, we’re only interested in the sections that run through wooded areas, and this is one of them. The wooded area this trail runs through, is known as the Ganaraska Forest which, due to political overmanagement, I usually choose to avoid. Every roadside access to the forest has a sign welcoming you to the forest. Further down on the same sign is a threat of trespassing charges if you access without a membership. Quite the welcome eh ? That’s one of the reasons I find this trail so enjoyable. The GHT & ORTA trails cut right through the Ganaraska Forest. They’re open to the public, and there’s nothing the Ganaraska Forest administration can do about it. Just follow the trails with the white rectangular paint marks on the trees, and you’ll be on public property. The signs are a joke really, ‘cause no one pays them any mind. Though I still find them pretentious. 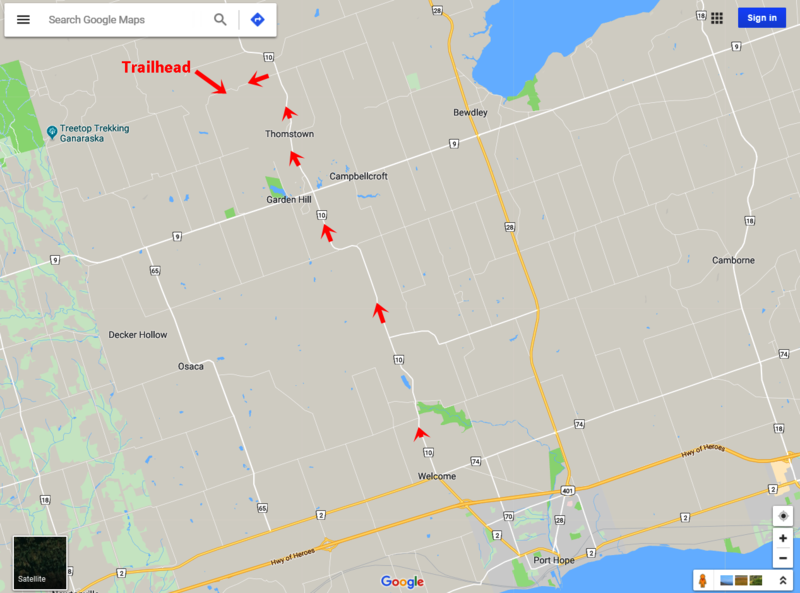 We call this trail “10 on 10” because we usually access it from the 10th Line just off County Rd 10 North of Port Hope Ontario. As you cruise West on the 10th Line from County Rd. 10, you’ll pass under an old 1800’s railway bridge. Continue on the 10th Line for about 375 meters past the bridge, and you’ll see a trail to your left. There will be a Ganaraska Forest location sign of EF5, another sign ordering No Loud Bikes, and an inconspicuous white rectangular ORTA Trail marker on the tree just to the right of the EF5 sign. You’ll have to park on the roadside (lots of room to do so). Ignore the two arrows pointing to the South trail. They don’t go very far, nor anywhere interesting. Take the trail to Walker Rd. (about 750 meters). You’ll emerge from the forest on Oak Hill Rd. (not Walker yet). 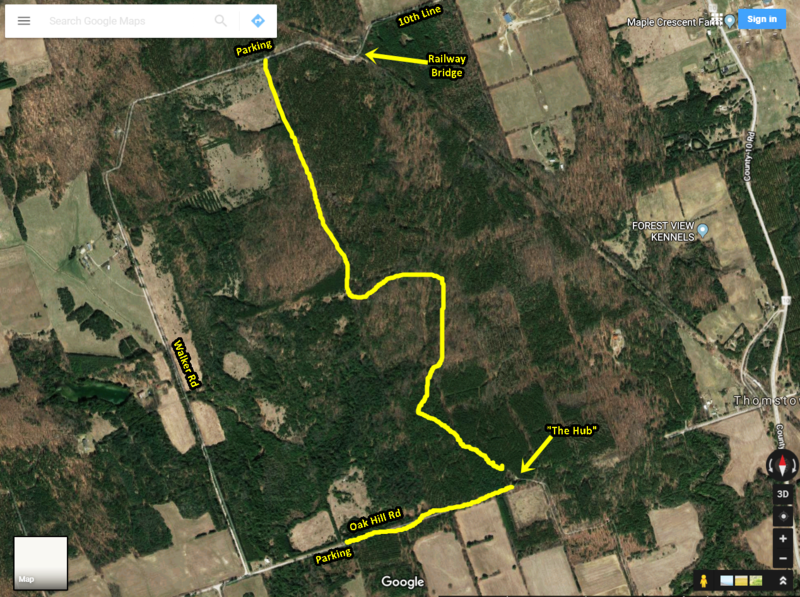 If you like, you can then make a loop by walking Oak Hill to Walker Rd. (turn right at Walker). Walk until it changes name to 10th Line and leads you back to your ride. That will add a 3.6 km road walk on top of the approximately 4 kms of forest you’ve walked. Otherwise, you can return to the 10th Line by the trail. However, I would suggest you consider walking the road as “Walker Road” is appropriately named. A lovely stroll through open countryside, which then plunges into the same forest the trail traverses. The roads have very little traffic as well. Mind you … if you thought the trail was hilly, you won’t believe the road ! There’s plenty of parking at the No Exit sign at the end of the road. Again, follow the white paint marks on the trees until you come to the hub, about 750 meters ahead. From there you can head North to the 10th Line. This return, or potential roadway loop trail (the roads are even hillier than the trail though) is a small part of another pair of much larger trails. However, it is through a better part of those trails. There are no parking lots, but both access points have ample roadside parking. There are of course, no facilities. Dog walking is permitted. The terrain is rather hilly, and the trails are wide enough for two to walk side by side. The forest is mostly regenerating fake forest (rows of man planted trees from the 1940s to control erosion). However, you’d be hard pressed to notice, for most of its distance. Please don’t be misled by the Wintery photos. This trail is definitely NOT a winter walkable. I took two back – slams on the icy hills while getting the photos for this review. I just couldn’t resist the gorgeous blue sky that day. As with all GHT or ORTA trails, if there are two white rectangular marks, the lower designates the trail, and the upper mark tells you which way the trail turns. The more observant of you, might notice the ORTA sign and white markers heading North from where you parked your car on the 10th Line. That trail will take you to the Ganaraska Forest Administration Centre which I have no desire to visit, so I’ve never walked it. Looks like a do-er for this Saturday. Have you encountered any ticks on your clothing on this or any of your other rambles? With a dog I have to be on guard. Well, watch your step Kevin. We checked again today, and there’s still plenty of ice on that trail. Funny you should mention ticks … I had to have one surgically removed from my thigh last April. I spent the rest of the season testing methods of preventing it from ever happening again (which it didn’t). Over the Winter I composed a write-up about my findings and will post it next Wednesday.